The staff are very friendly especially Dima she’s so helpful. It is just perfect! Location, staff, cleanliness of the rooms, easy and fast checkin checkout procedures. I like the size of the room its larger then most of the other hotels in Beirut. evrything is beautiful, the hotel reminds me in 90s which I am already missing it. Lovely stuff, great food, great for friends. Just about everything. The location is quite good and relatively close to the airport and also the city's center and coast. The rooms are very clean and have a wonderful look and style. The staff were very kind and helpful in many ways. Solid free Wi-Fi. The breakfast was delicious. It was the first time me and my wife book in a hotel as we are newly weds. The Hotel was great, very nice and spacious rooms. The team was fantastic, special thanks to Rageb, Ali , Dima , Mohamad. The valet personal were so helpful and it was a pleasure meeting them (mohamad , mohamad and Hamid who made our entry and exit excellent). Will definitely revisit and book again. The staff was professional and cooperative. The breakfast buffet was nice and satisfying. The gym was good. The location was very convenient. I would stay again in this hotel. My family and I requested two connecting rooms at the 4th floor. Golden Tulip Galleria Hotel This rating is a reflection of how the property compares to the industry standard when it comes to price, facilities and services available. It's based on a self-evaluation by the property. Use this rating to help choose your stay! Featuring free WiFi, Golden Tulip Galleria Hotel offers luxurious accommodations is located in Jnah. The embassies district and the business district are a 5-minute drive from the property. 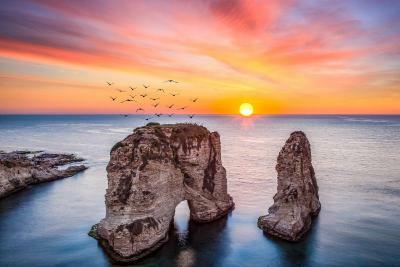 Beirut-Rafic Hariri International Airport is a 5-minute drive away. This 5-star hotel offers spacious accommodations with air-conditioning. Standard features include flat-screen satellite TV, seating area and a mini-bar. The executive rooms feature separate desk and working area. The bathroom is fitted with a bathtub and free toiletries. A variety of outlets are available for dining including The Palms serving International buffet selections. Guests can enjoy a drink at Champs Sports Bar. A variety of coffee specialties are served at Ristretto Café. Guests can enjoy a vigorous workout at the Health Club that is equipped with modern equipment and personal trainers. Golden Tulip Galleria Hotel has nine different meeting rooms and one ballroom that can accommodate up to 350 people. The ballroom and conference rooms are fully equipped with the latest in audiovisual systems. Golf Club of Lebanon is just 5 minutes by car, while Downtown Beirut is a short walk away. Free shuttle on daily basis to the shopping and business areas. Underground parking is available upon request at an added fee. When would you like to stay at Golden Tulip Galleria Hotel? This air-conditioned room has a small seating area. This air-conditioned room features a small seating area with a sofa and a coffee table. Spacious suite with an elegant décor. It includes a separate living room. Extra spacious suite with an elegant décor. It includes a living room and a large dining room. House Rules Golden Tulip Galleria Hotel takes special requests – add in the next step! Golden Tulip Galleria Hotel accepts these cards and reserves the right to temporarily hold an amount prior to arrival. Staff was very attentive and helpful! The keys for the rooms stopped working randomly! The view of the water from my balcony. i believe this Hotel's descriptions was overestimated as the pictures on the website doesn't refelect the reality of the Hotel. The furniture is very Old, the toilets also Old and not clean, the lunch buffet was not really nice. The room was spacious, clean, super comfortable bed and pillows!!!!! !